Take your green smoothies to the next level by using green tea as the base. Unless you brew a super strong batch of green tea, you won’t notice the taste in your smoothie, but will reap all the wonderful health benefits green tea has to offer. Honestly, I thought I knew all there was to know about green tea, but was overwhelmed by all the data I uncovered when researching. For more information on green tea and its vast and various health benefits simply run a Google search. If using green tea as the base of your smoothie doesn’t appeal to you, matcha green tea powder is another option. Matcha green tea powder is like regular green tea on steroids because with matcha you’re ingesting the entire leaf and not just the brewed water. Another “smoothie trick” to consider is making ice cubes out of green tea, or any tea for that matter, for use in your smoothies. Personally, I brew large batches of tea, cool, and use throughout the week. Now go brew up some green tea for use in the recipe below. Enjoy! If you try this nutritious green tea smoothie please leave a comment below. Happy Blending! Green Tea Smoothie Recipe sounds wonderful! Green tea is such a great way to have tasty treats and stay healthy. Just made this smoothie :- green te, handful of spinach , half banana and teaspoon coconut oil no honey though. Absolutely loved it. I’m trying to GAIN weight so what should i add ? Hi Ryan! Would you suggest a caffeinated or de-caffeinated tea when using tea in a smoothie? I tried this recipe out this morning using caffeinated green tea and adding 1/2 cup frozen raspberries, 1/3 cup plain greek yogurt and a few ice cubes. This was my first time using tea in a smoothie and I think it turned out pretty well! Will definitely be trying it again, thanks! I don’t use exact measurements when brewing large pots of tea :) I simply fill a big pot with water and dump in some tea. If you have loose tea with instructions for brewing, you can measure both water and tea. It’s by no means an exact science. You’re welcome, and thanks for sharing with your sisters. Love green tea smoothies, but have never made my own until I found this recipe. Very good, except for the spinach!… Definitely excluding that ingredient from the recipe next time. Tweaking my recipes to suite your palate is what I encourage. You could try 1/4 cup baby spinach and work up to 1 cup or exclude altogether. Tried it for the first time. Pretty good. Was a bit warm and think it would taste better cold. Will know later or tomorrow morning. Love the fact that I can use green tea instead of milk or juice. Water sounds to boring. Will definitely make it again. 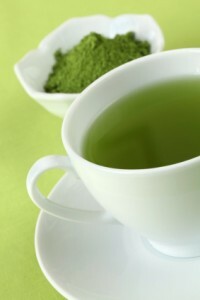 I often brew a big batch of green tea and refrigerate for the use in my next 4-5 smoothies. Might try that to save time. Hi could you drink green tea cold and would it have the same benefits as drinking it hot? Also how long could you refrigerate the smoothie for? Yes, cold green tea has the same health benefits as hot. Smoothies keep refrigerated for about 2 days and frozen a good week. Are oxolates anything to worry about in green smoothies? This was awesome. I did exclude coconut oil, and used all the add-ons (strawberries for me) including vanilla whey. I exchanged yogurt for half cup of unsweetened almond milk. This was delicious, and this recipe was great for a smoothie beginner like myself. I’ve made 4 smoothies and this was by far the best. AND my first time using spinach, which I could not taste at all. Might even add more next time. Thanks!! I’ve hear of people adding the contents of the teabag into the smoothie. What are your thoughts on this? Most tea is designed to be discarded after its steeped. Even if it’s “safe” to blend I would think most, if not all of the nutrition would have been extracted from the hot water. If the particular tea is OK to consume I guess it can’t hurt. Not something I’ve experimented with. Tea bags go into my compost. I modified it to green tea, spinach, half a banana to cut out some sugar, cinnamon and a scoop or protein powder. Also I have added some blueberries sometimes for some extra antioxidants! Tastes great! You really can’t taste the difference between making it with water and making it with green tea. This was delicious , I am new to smoothies, I don’t like tea so the thought was a bit off putting but I am glad that I tried it. I didn’t have any spinach so I used kale instead . Nice to hear your enjoyed this smoothie, Jane. Kale in place of spinach was good substitute. I made a smoothie with kale and green tea and I could not use it to bitter. Try using less kale next time or baby spinach. Was the amount of sugar listed in the nutrition information without any add-ins? Yes, without any add-ons, TimAyn. Looking forward to the healthy smoothie recipes! !